Midnight Sun starts off with XP sufferer Katie (Bella Thorne) introducing herself and why she has to be indoors all day behind tinted windows. She watches Charlie (Patrick Schwarzenegger) every day as he walks past her house on his way to school (not creepy at all). Katie is homeschooled by her (not so) overprotective father, Jack (Rob Riggle) and visited daily by her best friend — only friend, really — Morgan (Quinn Shephard). One night, after a decade or so of stalking her crush from her anti-UV room window, she meets Charlie at the train station where she frequently practises her guitar and singing. Conveniently, Charlie falls in love with her at first sight. From that point on, every plot point in Midnight Sun is sloppy and unconvincing. Granted, the love story can be quite a tear-jerker, because of how much every other character in the film is rooting for Katie and Charlie. Viewers will feel compelled or even obliged to join in. We all want a happy ending for our lovers, don’t we? Admittedly, the movie is beautifully shot, and the camera angles are pretty creative and amazing by cinematographer Karsten Gopinath. 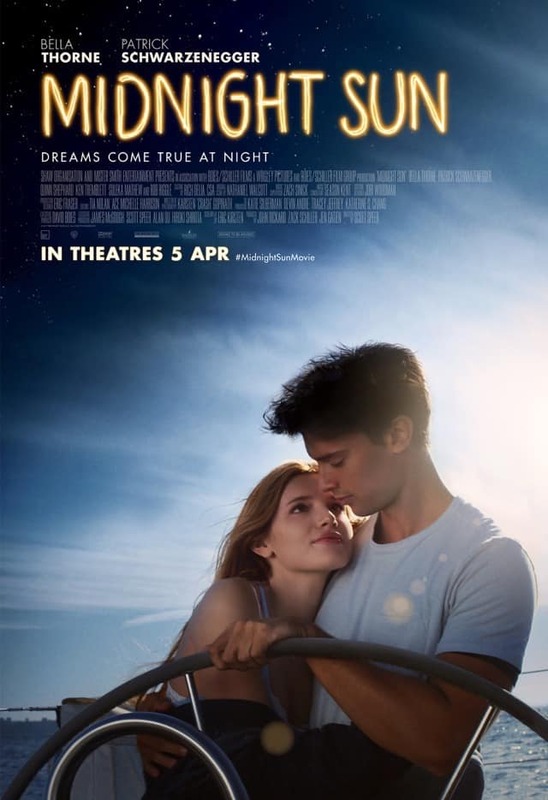 But director Scott Speer (Step Up 4) and screenwriter Eric Kirsten don’t seem to understand the importance of character depth in a romance and drama film like Midnight Sun. Sure, puppy love is something every teenager experiences, but their love story is just too fantastical and ungrounded in reality. Their situation, though dark, very much puts teenage romance on a pedestal and ignores the dynamics between two hot-blooded young adults. It paints an idyllic picture of an otherwise very messy and complicated phase most of us — if not all — face during our teens. Nevertheless, it is a refreshing image for Thorne, a former star of Disney’s Shake It Up. She grew up with three other siblings in a single-mother family and has expressed she took on this role because it resonated with her. Schwarzenegger (yes, he’s Arnie junior), on the other hand, is a pretty face with limited expressions. Above all, Midnight Sun looks very good on the surface if viewers can ignore the film’s disinterest in making it more than a fairy tale. Summary: A touching teenage romance story that resembles a Disney fairy tale more than real life – minus the good storytelling.